You can go ahead and mail me your dog as well…. What a super cutie! I love that face. Do you like having a French bulldog? I’m trying to persuade my husband to let me get one! I traveled on a show circuit with a Frenchie breeder, and I helped her show them. They are very, very sensitive to temperature. If it was over about 75 degrees, we carried water bottles to mist their bellies. They can’t breathe well when they get too hot. If you get one, be sure to buy from a breeder who does lots of genetic testing on their brood stock. Don’t get one that is listed in the newspaper or on Craigslist and is available to the first person with the cash. A good breeder will make sure this is the right breed for you before they sell. 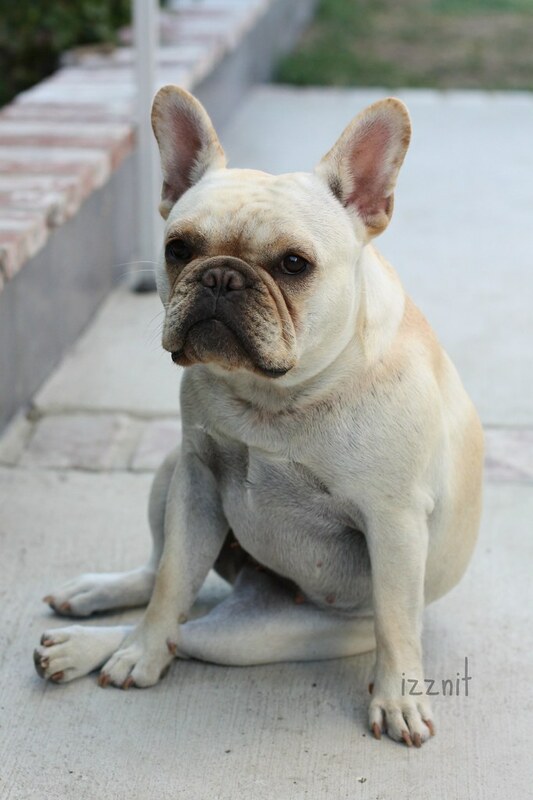 Frenchies are predisposed to elbow, eye, hip and skin problems, so make sure you get a health guarantee. The two above mentioned important things to keep in mind. I want to emphasize, if you decide to go with a breeder, make sure it is a REPUTABLE one (search the AKC website). 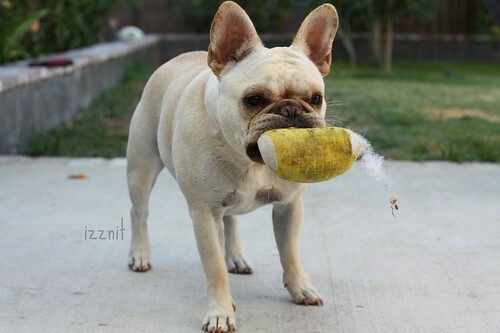 There are many websites that advertise purebred frenchies when they might not be (instead are from puppy mills). Also beware of BROKERS. Wow! This is all wonderful. So many things to think about. Thank you! You might enjoy my post called “Canines in Conical Hats: Lucy does Vietnam”–photos of my Maltese when we lived in Vietnam. 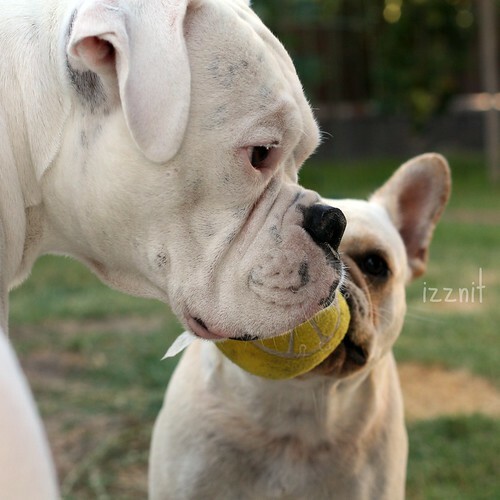 So precious – and the white boxer looks just like my grandpuppy, Iris, who is no longer with us. Love pups of all kinds. I want a french bulldog so bad! I’ve been trying to find one for months now! Yours is adorable. Great photos. What a sweet puppy! Wish I could get my cats to fetch like that. Hilarious! & I looooove your blog header. I laughed. Love the photos….and your dogs. I have a Boston Terrier granddog and the face is similar to the French Bulldog. Such cutie pies!!! 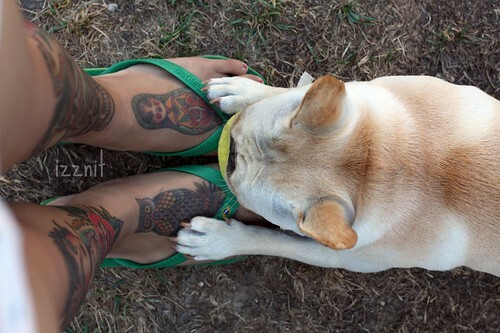 your french bulldog is such a cutie patootie!! Soooo cute!!! LOVE these photos!! Incredibly cute dogs and lovely pictures. your aprons on etsy are ADORABLE! your doggie isn’t too bad either. Gah! I’m so in love with French Bulldogs and Boston Terriers!! LOVE these photos :)! Absolutely precious! I especially love the picture with the toy. My dachshund does the same thing. He loves squeaky toys, carries his newest one with him everywhere, and rips it apart until he gets the squeaker. French Bull Dog and what kind is the big one? Both are fine. Have the healthiest, happiest life with them. Some day I will add a French Bulldog to my collection of Boston Terriers. I adore them! This has been the animal of choice by my two young children…..are they good with little kids? What a cutie pie! I can’t speak for a whole breed but mine is a bit rough when she plays, perhaps because she thinks she’s a boxer (have two of those in my house as well)?! The ears are dynamite! I love it! I’ve never seen so much expression in a pup before. Oh what beautiful, adorable, irresistible FACES! I want to reach through the monitor, pet them, and spoil them rotten! That dirty yellow toy looks awesome. I can see why they guard it so fiercely. I want one. I love your pictires!!! We have 2 english bulldogs, Molly and Bently. They are the best, but I have to be honest my next one will be a French Bulldog!! Thanks for sharing!! Thank you! They are pretty fantastic dogs 🙂 I’d love to have an English one day though! They are sneaky devils! Thank you! Great pictures! And I love the cute little bugger in her ruffled dress in your banner shot. 🙂 I have a boxer who looks a lot like the one above. And I checked out some of your aprons too–some of them are hot! They look more like dresses! Thank you! And that you knew he was a boxer and not a bulldog made me smile. Cheers! Adorable pups and great snaps! Very cute photos. Thanks for share. Aw just so cute! That’s great you got freshly pressed with your precious dogs! Congrats! Love her!! Frenchies are amazing dogs. I want to get one but we’ve got enough of a zoo right now as it is. Thank you for sharing your adorable dogs and beautiful photos.